Acc ording to POLITICO, Wasserman Schultz’s possible role in the scandal was suggested when the lawyer for the Broward County Supervisor of Elections offered to supply the court with a sworn affidavit from Wasserman Schultz opposing the lawsuit we brought to inspect the ballots. Incredibly, the Supervisor’s offer was made more than two months after the Supervisor had already destroyed the ballots — during which time the Supervisor continued to conceal the ballot destruction from both us and the court. In destroying the ballots, the Supervisor violated federal and state law, destroyed evidence in an ongoing lawsuit, and concealed all this wrongdoing for months. With the original ballots destroyed, a criminal investigation may be the only way to get to the truth about this election. We contacted the Federal Bureau of Investigation to report these federal crimes, but the FBI has yet to return our calls, even after the Supervisor admitted to her illegal conduct in a videotaped deposition! 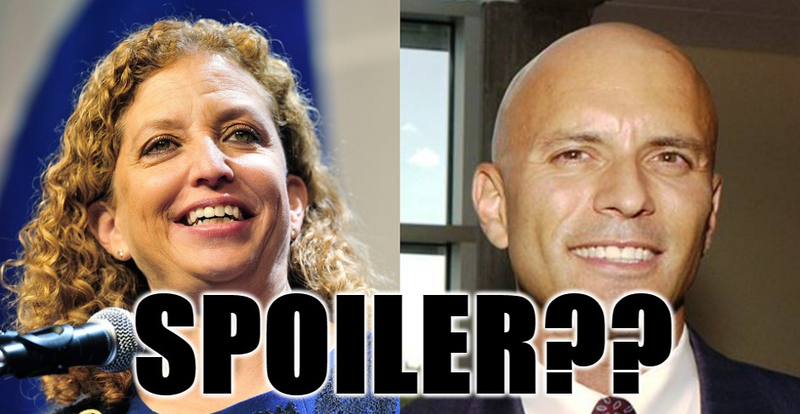 Should we believe Wasserman Schultz’s denials of any role in the decision to destroy the ballots? Sadly, there’s no reason to believe her. Let’s not forget that Wasserman Schultz was forced to resign in disgrace as head of the Democratic National Committee for violating the DNC’s own rules for fairness and impartiality in the presidential nomination process — violations that she continually lied about! To remain silent about all the election frauds that happened in the 2016 primaries only serves to normalize election frauds on an ongoing basis. That’s why we’re demanding a federal criminal investigation of the illegal destruction of our ballots and the immediate suspension of the Broward Supervisor of Elections. Thank you for all your help and for supporting our efforts for election integrity. It was our lawsuit against the Supervisor of Elections that first revealed the illegal ballot destruction. Now we need your help to continue with our investigation into this scandal. Please donate what you can and help us reveal the extent of the wrongdoing, including any possible role played by Debbie Wasserman Schultz! Your donations, when combined with thousands of other small donations, are making a huge difference in our efforts to reveal the truth about all this corruption. A group of Democratic senators is introducing a bill aimed at securing U.S. elections from hacking efforts, the latest response to attempted Russian interference in the 2016 presidential vote. The bill introduced Tuesday is specifically designed to ensure the integrity of and bolster confidence in the federal vote count. It would require state and local governments to take two steps to ensure that votes are counted correctly. Under the legislation, states would have to use voting systems that use voter-verified paper ballots that could be audited in the event a result is called into question. State and local officials would also be required to implement what are known as “risk-limiting audits” — a method that verifies election outcomes by comparing a random sample of paper ballots with their corresponding digital versions — for all federal elections. Both steps have been endorsed by cybersecurity professionals as a way to ensure confidence in the vote count. Homeland Security Secretary Kirstjen Nielsen has also recommended that states transition to voting systems that generate paper backups that can be audited. “Congress must act immediately to protect our democracy from cyberattacks. Any failure to secure our elections amounts to disenfranchising American voters,” Sen. Ron Wyden (D-Ore.), the lead sponsor of the bill, said in a statement. “For Americans to have confidence that their votes count, and that election results are free and fair, there absolutely have to be paper ballots and mandatory audits for each and every federal election,” Wyden said. Currently, five states use paperless voting machines that do not produce a paper backup, and many more have mixed voting infrastructure with some localities using paperless systems. Twenty-two states do not legally require post-election audits. Revelations of Russian meddling have triggered fears about the possibility of future interference efforts that could cast doubt on the outcome of U.S. elections. The Department of Homeland Security revealed last year that Russian hackers targeted election-related digital systems, such as voter registration databases and websites, in 21 states as part of a broader plot to interfere in the 2016 vote. In a small number of cases, hackers succeeded in breaking into systems. Officials maintain that none of the targeted systems were involved in actual vote counting, and that there is no evidence any votes were changed. Some security experts say it would be difficult to wage a hacking campaign against voting machines, which are not connected to the internet and are typically stored in secure facilities. Experts say it’s unlikely that hackers could actually have a material impact on the vote. Others, however, are more skeptical of the security of voting systems. There have been other attempts in Congress to address election security at the state level. A bipartisan group of senators is currently trying to attach election security legislation to a must-pass defense policy bill moving through the upper chamber. And Congress already sent $380 million to states to upgrade old voting equipment and shore up cybersecurity as part of a massive funding package approved in March. The bill introduced Tuesday is sponsored by Sens. Wyden, Merkley, Kirsten Gillibrand (D-N.Y.), Ed Markey (D-Mass. ), Patty Murray (D-Wash.) and Elizabeth Warren (D-Mass. ).